I decided to read this book because it seemed to center around a mother-daughter relationship, a premise I found compelling. It certainly delivered more than I expected, and although there are plenty of clichés in the story, it was actually quite refreshing. Devan has lived in the Midwest with her father and her stepmother her whole life. She’s never met her mother, and until recently she didn’t even know who her mother was. But one serendipitous day she came across a book by famous author Reece Malcolm, a book that was dedicated to her. So after some digging, she finally knew who her mother was, and she even managed to make a short list of all the things she was able to find out about Reece, minor things like where she went to college or how she likes her coffee. But when Devan’s dad dies she has to go live with her mystery of a mother in L.A. and her life suddenly becomes a huge question mark. Reece and Devan are wary of each other, which makes their interactions awkward and at times even hurtful. But life in L.A. isn’t as awful as expected, and even her hipster new high school is filled with surprisingly welcoming people. There, she finds shelter in musical theater as well as in her new classmates, and she even develops a serious crush on the cute but unattainable guy. However, figuring out Reece Malcolm is what truly drives her days, because by doing so, maybe Devan will be able to figure out her place in life. This book was engaging, entertaining and full of heart. It has all the potential to be a melodramatic mess, yet Devan and Reece are as far from melodramatic as it gets. Devan is in a bit of a shock and too afraid to upset the fragile balance in her life, which makes her shy away from confrontations and questions that are more than necessary. Communication is something she has to learn how to do, but in the meantime she’s not throwing temper tantrums. Reece, on the other hand, is just plain awkward and doesn’t know what to do with Devan. We never get her point of view, yet what we see through Devan’s eyes, paints a clear picture of the most interesting and complex character in the book. This is a woman who left her baby and (apparently) never looked back (due to spoilerish circumstances that make sense). She’s selfish and hurts people without realizing it, but I never dislike her, and she is never a villain. She’s inherently good, but deeply flawed, and I think she would make a fantastic Romance heroine. Once Devan goes to school, she meets a diverse set of characters (including the token potential gay best friend). One of them is a boy she falls for, but who doesn’t seem to like her that way, so instead of dying of unrequited love, she allows herself to be with someone else and enjoy herself. It smells of love triangle and it’s obvious that the unattainable boy is really into her, but by not being together they get to know each other as friends first and the angst levels in their relationship are quite low. But even better was reading about a girl who knew and respected herself, and demanded the same respect from others. The book isn’t perfect, though. As much as I liked Devan, I found her too passive and unnaturally well-behaved. Her apparent perfection was grating, because it felt like there was a lot of effort put into making her likeable, and not enough effort put into making her real. But she sets the tone of the story, and it’s so different and refreshing that’s impossible to feel too annoyed. Not to mention that her character brings balance to the dynamic in her relationship with Reece. 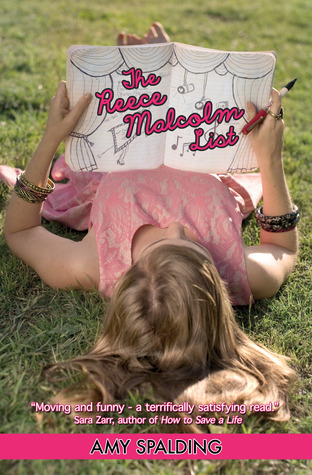 The Reece Malcolm List is undeniably YA, and a very sweet one at that. There are some dark themes in the book, but it’s an uplifting, happy read. Devan is a teenager and her voice matches what one would expect from a teen, so it might put some non-YA readers off, but it’s not a dumbed down narration; it’s honest. I highly recommend it, especially to those who enjoy the genre. Entangled Teen. February 5, 2013.
nice review. The book sounds good and interesting. You've been recommending it and I know Ames has enjoyed it as well. Guess I'll be picking this one up eventually. Thanks!